Diabetes is a metabolic disorder characterized by elevated blood glucose levels. Although conventional treatments such as insulin and other drugs reduce blood glucose, there is still a therapeutic need for effective orally administered drugs. 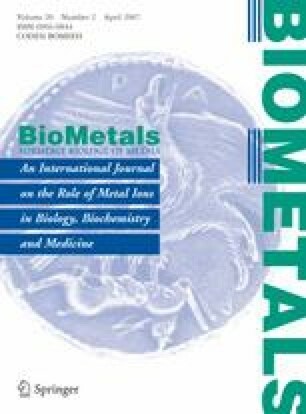 Trace elements like vanadium and tungstate have been successfully demonstrated to reduce blood glucose in experimental diabetes with minimal chronic complications. We investigated the anti-hyperglycemic effects of cobalt in streptozotocin-diabetic rats. Normal and diabetic rats were provided with drinking water containing 3.5 mM cobalt chloride for three weeks followed by 4 mM for four weeks. Body weights and fluid consumption were monitored on a daily basis, while food intake was recorded twice every week. Prior to termination, an oral glucose tolerance test was performed on the animals. Diabetic rats lost significant body weight (357 ± 2 gm) compared to controls (482 ± 3 gm). Body weight was further reduced by cobalt treatment (290 ± 2 gm). Although it was difficult to establish a dosing regimen without weight loss, food and fluid consumption in cobalt-treated diabetic rats improved significantly compared to untreated diabetics. Plasma glucose levels were significantly reduced with reference to diabetic controls (29.3 ± 0.9 mM) by the fourth week to a lower but still hyperglycemic level (13.6 ± 3.4 mM). Cobalt-treated diabetic rats demonstrated an enhanced ability to clear a glucose load compared to untreated diabetics. Cobalt treatment neither affected the feeding and drinking patterns nor plasma glucose in normoglycemic animals although body weights decreased compared to untreated controls. We conclude that chronic cobalt treatment decreases plasma glucose levels in STZ-diabetic rats and improves tolerance to glucose. We thank Violet G. Yuen and Mary Battell for their assistance through the course of this study. This study was supported by a grant from the Canadian Institutes of Health Research to Dr. McNeill. Harish Vasudevan received financial support from a program grant from the Heart and Stroke Foundation of BC and Yukon.